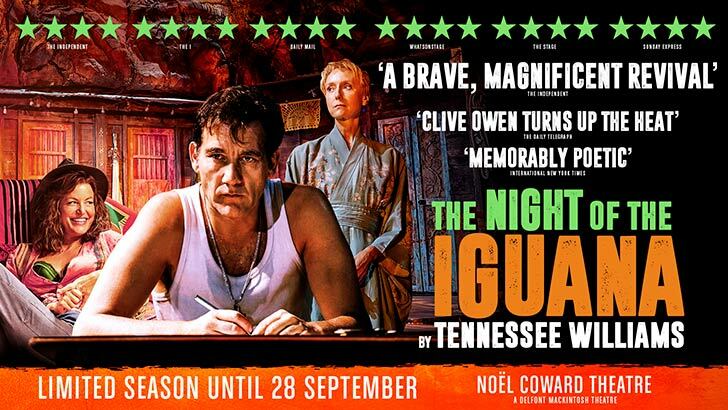 The running time of THE NIGHT OF THE IGUANA is to be confirmed. For evening performances a theatre bar will be open from 6.00pm and the auditorium will open at 7.00pm. For matinee performances a theatre bar will open at 1.45pm and the auditorium will open at 2.00pm. *All prices include a £2.25 online booking fee. An additional 50p booking fee will be added to telephone bookings. Booking fees do not apply to tickets purchased in person at the box office. Bands A & B seats reduced to £45.00. Valid Tuesday - Thursday evenings, Wednesday matinees and extra matinee performance Thursday 18th July 2019. To add some extra sparkle to your evening, why not upgrade your The Night of the Iguana booking to one of our Champagne or VIP Packages? Prices start from £130.00 per person until 15th July 2019 during previews (£140.00 from 16th July 2019), inclusive of VAT. If you have already purchased your tickets, you can add this package from £40.00 per person, inclusive of VAT. Please call 020 7766 2112 to upgrade your booking. If you have already purchased your tickets, you can add this package from £95.00 per person, inclusive of VAT. Please call 020 7766 2112 to upgrade your booking.